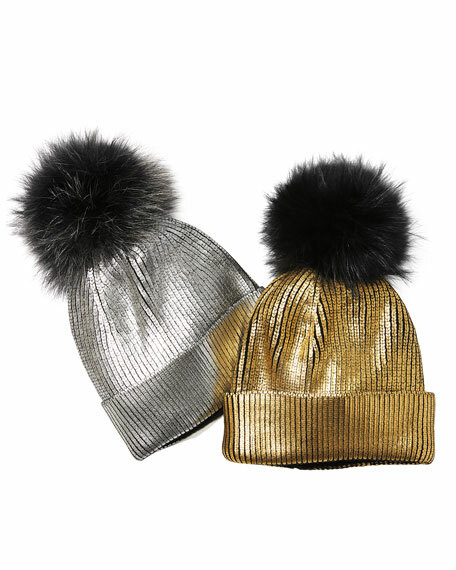 Jocelyn beanie hat in metallic knit. Silver: dyed fox (China) fur pompom. Black and gold: dyed rabbit (China) fur pompoms. Since its inception in 2001, Jocelyn has been the go-to for fashion editors and bloggers for the most updated fur accessories. From season to season, the robust collection features new versions of favored staples like the infinity scarf, mittens, and signature Roadie vest. Jocelyn also has a home line which boasts bold pillows and throws, and punchy accent pieces. For in-store inquiries, use sku #2724069.